Here’s an update on sticking pictures to walls with Command Velcro-style picture hanging strips, about which I wrote before. (If you haven't read that article already, I suggest reading it before reading this one.) I continue to be very impressed with these, but I have additional experience that I would like to share with people here as I’ve been putting up a lot of pictures in my new home. First of all, as you might guess, these are not a good option for frames that have paper on the back. They will stick, but if you were to try to remove them by unzipping the Velcro-style connection between the two strips, you run the risk that the strips would remain together and the paper would rip off. Therefore, for such pictures, I continue to use maze picture hooks. If the frame already has a picture wire, then you can usually remove the hardware that holds the wire in place, like screw-eyes, because they will prevent the back of the frame from getting close enough to the wall for the Command strips to work. Also, if you have a hybrid frame that has a fold-up kickstand for tabletop display, and you don’t want to rip that off, then you have to make sure it is thin enough so that the Command strip sandwich will still connect the back of the frame to the wall. I also realized in my current round of picture hanging that if the frame is not completely flat, it can cause problems. As you can see in these photos of a couple of small framed pictures in a stairwell, they are working very well but there is one frame that apparently has a slight bend to it, and that prevented the sticky back of the Command strip against the wall from sitting flush on it (rightmost photo, upper part of the strip; you can click on the picture to enlarge it)). I am not too concerned though, because most of the strip is on the wall and I haven’t seen evidence that it is slowly peeling off; it is just off of the wall in the part where the frame is bent. The rest of that strip, and all of the other three strips, seem fine. By the way, other than this one instance of the sticky part of the strip not completely being flush with the wall, I have not observed any other instance of these becoming separated, either at the sticky surface or at the Velcro interlocking faces. 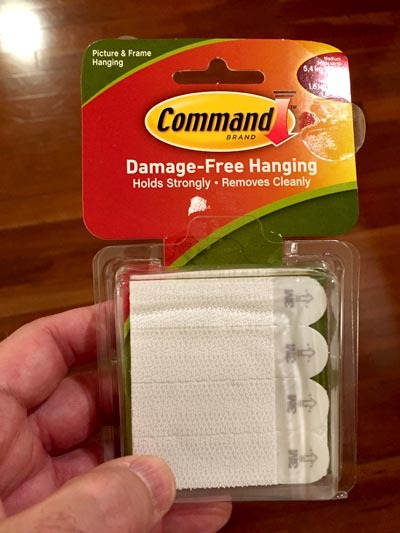 I mentioned these Command strips at one of my talks and someone in the audience said that they had had a bad experience with them coming off, and I was hoping to find out more about that and requested that they e-mail me details afterward but they didn’t contact me afterward, so I don’t know if it was a situation like this one instance I’ve described here. It does not appear likely to me that the interlocking Velcro part will spontaneously come undone, and the sticky parts of regular Command strips (i.e., not the Velcro style, but the single strips that attach hooks to walls) have been very stable over many years in my experience. I also used the Command strips to stick this ornamental plate to the wall (shown above); two strips at the top and one in the middle. Quite nice! One disadvantage of using the Command strips is that if you decide to repaint your walls, you won't just be taking pictures off of hooks and pulling nails out of the wall temporarily. You'll either have to paint around the wall-mounted half of the Command strip pair (which means you'll see the footprint if you later remove that strip to reposition the picture), or you'll have to permanently undo the whole set-up and start again from scratch after the paint job. Now here’s one more issue: I put a couple of small pictures on a bathroom wall with the command strips and they look great from the front, but you can see in the photo that the pull tabs of the strips are somewhat visible from the side on the wall, and very obvious in the reflection of the frames in the mirror! Even though the wall is near white and the pull tabs are white, they show through the shadows easily (upper photos; click on the figure to enlarge it). These Command strips are also available in black, and I had avoided those because I figured they would clash with a white wall. However, I tried them in this case and I was completely wrong before: the black ones don’t clash with the white wall; instead, they blend nicely into the shadow (lower photos). MUCH better looking in this case than the white ones. I actually tried a hybrid in which a white one was on the wall and a black one was on the picture frame, but that one white pull tab was still visible. So don’t be afraid to use the black ones in a shadow situation if the frame is black. By the way, in case it doesn’t go without saying, I don’t suggest determining what size strips to use by the weight capacity listed on the package. That figure is set to avoid spontaneous failure on stationary walls, NOT for separation during shaking in an earthquake. I would err on the side of larger strips. Well, it’s been about a year and a half since I first started experimenting with these Command Strips and wrote my original article about them. Having used maze picture hooks as much as possible before these, what is my current default approach to hanging pictures? Actually, I would say I have about half maze hooks and half Command strips. I’m using Command strips for framed pictures that are relatively light-weight and no more than about 3 feet wide (no magic number there; I’m just going by the feel of it), for unframed pictures even if they are larger if they have a broad enough back edge for the strips to stick, and for objects like that metal plate above that can’t take picture wire (see the couple of examples shown in the accompanying figure). I’m using maze picture hooks for the larger, heavier framed pictures. If they are just very large but still relatively lightweight (for example, if I can easily pick it up with two hands and position it on the wall), I’m using a single maze hook nailed into the drywall, or two maze hooks several inches apart lined up horizontally if the picture is wide enough that I want extra stability. If the picture is REALLY big and heavy, like the very large picture shown below, then I go for two maze hooks lined up horizontally 16 inches apart and bolted into the wall studs. As I wrote about in an earlier article about maze hooks, I also use these for heavy objects suspended from string like metal gongs on the wall, with the hook bolted into a wall stud. One more evolved part of my strategy is that I no longer use small pieces of quake putty in the lower corners to stabilize the pictures from rotating or swinging out, because that does involve risk of shiny marks on otherwise flat paint surfaces. I am now routinely using small cut-out rectangles of “Gripeez” (see my 10/23/17 article), which is one of the modern polymer-based tacky gripper pads that stick well with no adhesive residues and no alteration of painted surfaces of which I’m aware.